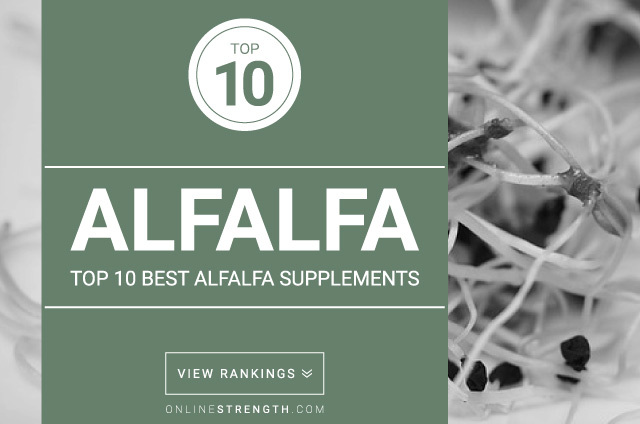 Onlinestrength analyzed 10 best-selling Alfalfa supplements in the United States for alfalfa content and heavy metal (arsenic, cadmium, lead, mercury) contamination. Alfalfa is one of the earliest plants cultivated for its ability to feed humans and livestock. Its very easy to grow and thrives in may varied climates, and provides a number of vitamins and minerals. Its abundant stores of vitamins and nutrient sense properties are often used as natural treatment of upset stomach, bladder problems, and common colds. Alfalfa contains high amounts of the vitamin beta-carotene, various b-vitamins, vitamin c, e, and k – and can be taken as a nutritional supplement. Numerous studies indicate that the extracts of alfalfa might be helpful at reducing cholesterol levels. Studies also show that alfalfa can be effective at fighting off fungal infections inside the gut. Alfalfa might be able to provide relief to a number of aliments including aging, cancer, diabetes, high cholesterol, and menopause systems. There are a number of ways you can take or use alfalfa. Most common way to supplement alfalfa is as a tea, 1 – 2 teaspoons per cup, steeped for at least 10 minutes. Taking alfalfa in capsule, powder, tablet, or extract form is also very effective and should be taken according to the manufacture’s recommendations.